Lottie Daley, a young teacher interested in psychic lore, was sure that the handsome stranger was the creature of legend, born of a virgin centuries before. The legend whispered that he appeared every twenty-five years, accompanied by the black dog who guarded his mothers grave. Lottie could sense his sinister and hypnotic influence sapping her will and pulling her into the strange world of the psychic occult – toward a strange and horrifying death. Written by Georgena Goff. First published Belmont productions 1971. 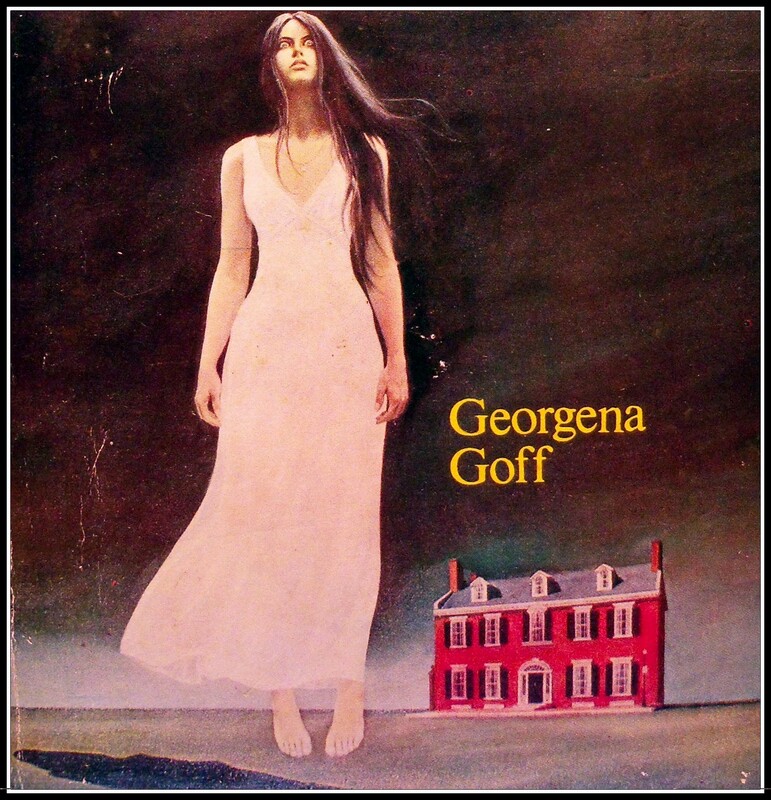 This Five Star Paperback published by PBS limited 1973. More canine confabulations this month courtesy of Five Star Paperbacks. I love my Five Star paperbacks! They can always be relied on to deliver the goods in the gothic-occult-thriller pulp fiction stakes. Lottie is engaged to be married to Jed, a ‘spook-investigator’ currently writing a book based on a local medium called Holmes and the legend behind the source of his psychic powers – allegedly dating back through his family for twelve generations. On meeting Holmes, Lottie finds herself irresistibly attracted to his magnetic charms and mesmeric powers. Turning up at his house one day she finds him seated in an enormous gilded cage, projecting images on to a large television screen and she cannot resist him any longer. The deal is subsequently sealed when they are married by Holmes himself in a solitary midnight ceremony. Alas, much to Lottie’s chagrin, it is not her body Holmes is lusting after and for the rest of the book she spends alot of her time listlessly wafting around in a floaty white nightie, weeping hysterically into her pillow. Isolated from Jed and trapped in Holmes’ mansion, the naturally feisty Lottie is unable to do anything for herself; it seems the more she loves Holmes the more she is sapped of her energy. Black Dog is an enjoyable read; the writing is a bit touch-and-go at times but the unashamedly wanton kookiness of the plot more than makes up for that. There’s something for everyone here – strange cults, spooky seances, shapeshifting incubi and an impregnated mad woman imprisoned in the cellar. Five out of five stars – naturally! An interesting note about the cover. I’ve noticed quite a few gothics seem to recycle the same covers for different novels. Why is that? 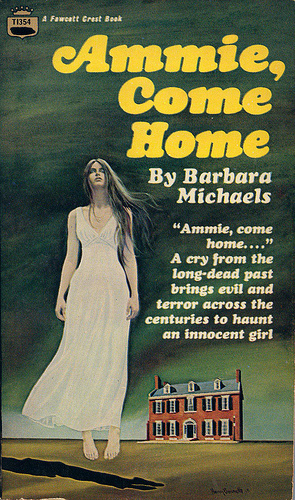 As you can see, this cover is the exact same one used for the Fawcett Crest edition of Ammie Come Home by Barbara Michaels. The cover art here has a signature (Harry Bennett?) which isn’t visible on the Five Star edition. 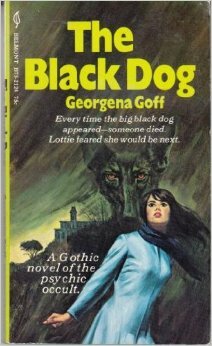 And here is a much more evocative and fittingly canine cover for Black Dog. This mass market paperback is the 1972 Belmont / Tower edition.